George Graham Reviews "The Derek Trucks Band"
Musical prodigies are a perennial phenomenon. Kids with abilities seemingly beyond their years have been noted going back centuries, with Wolfgang Amadeus Mozart being history's most famous example. In the rock era, performers achieving fame at an early age range from teen rock stars of the 1950s though Stevie Wonder and Steve Winwood, to singer-songwriter Janis Ian to banjo virtuoso Béla Fleck, who emerged with his debut album while he was still in his teens. The guitar provides fertile grounds for youthful players to make their mark. Some have been flashes in the pan, while other including Eric Clapton and Richard Thompson have had durable and respected careers after starting at an early age. Lately, there have been some teenaged blues guitarists who have been attracting attention, including Johnny Lang and "Monster" Mike Welch. This week we have another teenager to emerge as a formidable blues-influenced guitarist with a very impressive debut album. 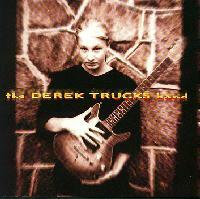 Eighteen-year-old Derek Trucks has released a recording called The Derek Trucks Band. Jacksonville, Florida, native Derek Trucks came to music naturally through his family. His uncle, drummer Butch Trucks, is a founding member of the Allman Brothers Band. Derek played his first professional gig at age 11, and soon began attracting attention with his band. It waasn't long before they were opening for and occasionally jamming with prominent acts such as Bob Dylan, Buddy Guy, Widespread Panic and the Gregg Allman Band. More recently, Trucks has been featured as a sideman or guest soloist on CDs by Junior Wells, Clarence Gatemouth Brown and Col. Bruce Hampton with the Fiji Warriors. While Trucks plays with a bluesy slide guitar technique, he draws his influences from a wide circle, citing everybody from bluesman Howlin' Wolf to jazz iconoclast Sun Ra. Indeed, his debut album shows a surprising degree of jazz influence -- all the cover tunes on the record are jazz standards by John Coltrane, Wayne Shorter, and Miles Davis. Now based in Atlanta, Trucks heads a mostly-instrumental quartet including keyboard man and occasional vocalist Bill McKay, drummer Yonrico Scott and six-string-bassist Todd Smallie. All are very capable, tasteful players who serve up an interesting and hard-to-categorize blend of jazz-rock fusion, blues, straight-ahead rock and a little funk. And though this is Trucks' album, each of the other band members gets ample solo opportunities, and each proves his mettle. Unlike many of the young hotshots, Trucks does not attempt to impress through sheer technique and flash, but immediately comes across as a mature player who seeks to innovate through his eclecticism as much as anything else. There is a saying about the music of Mozart that I think could equally apply to blues or jazz standards, and that is it is best played either by the very young or the most experienced, venerable musicians. The kids approach the music with an innocent charm or with the cocky self-assuredness of a teenager who is sure that he knows much more than any adult could possibly know about music. That is soon replaced with the realization of how much there is still much to learn. Finally with age and experience comes grace and authority, which only the older musician brings to performances of say, Mozart, the blues or jazz standards. Derek Trucks still has the teenager's chutzpah that would lead him to attempt John Coltrane and Miles Davis on a slide guitar, but he already has enough experience and taste to make it come off remarkably well. The result is a very satisfying album with some impressive musicianship, and perhaps a surprise or two. The Derek Truck Band was produced by long-time producer John Snyder, who has worked with people like Etta James, Dizzy Gillespie, and Ornette Coleman over the years. Perhaps it was Synder who helped to cultivate some of the album's interesting jazz influence. He undoubtedly encouraged this album's great sense of good taste, which is all the more impressive from as young a picker as Trucks still is. The album called The Derek Trucks Band marks the very impressive recorded debut by the eighteen-year-old guitarist namesake. Trucks, who has already appeared on several albums as a sideman, embodies an interesting juxtaposition of musical taste and maturity, with teenage hubris in tackling jazz standards that an older musician might treat with a kind of reverence. Trucks and his excellent band plunge in, engaging in such heresy as giving Coltrane a Southern rock boogie treatment on slide guitar, and for the most part, the results are interesting and satisfying. The original material, written usually in combination with his band members, is uniformly first class. The result is something that certainly gives one hope for the future generation in music. In production and sound quality, this album is also a class act. John Snyder's production brings out the best in the band, and the mix by veteran Southern rock producer-engineer Johnny Sandlin is outstanding, using the technical tools of the studio tastefully and effectively to enhance the music, rather than to distract from it. There is also a good dynamic range, something that is getting to be a rarity these days. Musical prodigies have been with us for a long time, and guitarist Derek Trucks proves to be an outstanding player regardless of age. One wonders what he'll be like ten or fifteen years from now.